BTW the Dow has completed the multi-year cycle down trend line break. This is a big big confirmation that the 7 YCL is over. Gary, since your 25% discount offer is for a yearly subscription, why not consider making the offer available to everyone who currently is not a Premium member– Providing that the person Never bought a full yearly subscription before. Yes, I agree that everyone can afford a $200 subscription. But since this 25% discount offer is only for the yearly subscription, why not make it more fair and make the offer available also to everyone that Never bought a full year subscription before. How about 25% off your agressive portfolio yearly subscription? If you can’t afford the subscription price without blinking an eye then you don’t belong there to begin with. The best money you will ever spend. Well guys…I just re-joined Gary’s Premium membership with a full year this time around. You may want to consider taking advantage of Gary’s offer today before it expires. I learned quite a bit from SMT during my previous 6 month membership. I never have been a fan of the regular stock market; I prefer dealing with the miners. However, I do believe Gary has everyone’s best interest at heart and his stock market call most-likely is a good one. Personally, I hate debt…it tends to bring out the worst in people…at least from my experiences. Your top billing in my book Gary!…very generous indeed. closed my long treasuries position with a tidy profit now that commodities have entered a new daily cycle. Sold silver miners yesterday and bought one back for less then sold this morning… now – 3% in it. I don’t like how metals perform in such a dollar down move …, too weak, it fills exhausted. We don’t have confirmation of a runaway yet. As a matter of fact if the Q’s post a reversal candlestick today I will take profits on long positions and go to the sidelines and see if we can’t get a recognizable DCL. Yes they are kind of like options. You have to make your bet and let it ride. The swings are too large to use normal stops. You will just end up decimating your account with stops on both the 3X funds and options. Not to mention options have ridiculous spreads as a percentage of the price. I maintain they are for suckers. What is your opinion of doing vertical call spreads on LABU using April expiration? Unless you are doing 1000’s of contracts, why not just do half of your normal option trade instead of a vertical spread? Spreads to me, unless you have some specific purpose, are pretty bi-polar. A portfolio change was made today for subscribers. You finally going to join the bear party? SPX is up 33rd day, 8th week from bottom. Time to unload some? Getting ready to jump out, I’m waiting for the final push.. with open eyes..
Just when I thought I would be jumping in. I suppose I can wait until next round. Back to my computer – we have a new member in the house: Codrin Teodor, aged 11 days. yes, indeed, metals weakness despite dropping USX is not good. and also agreed that shorting stocks is not a good idea…yet. Good night, mate, and to ya all! Now loaded 100% vix and x3 short s&p. As well as 100% dust and short x3 gold. very generous offer from Gary. If I make anything from the next correction I just have to pay full amount. Maybe old bear can learn new tricks after all. I went 100% short at the close. Waited 3 weeks for this top to form. See you boys at 1950. 7 YC my [email protected]@. Only thing that happened was they suckered in the last of longs. Commercial are heavy short based on COT. No the commercials are not short. Again you aren’t looking at the complete picture. The large contract is short but nowadays 90% of the volume is in the emini contracts and those are heavily long. As a matter of fact the blees rating on the S&P emini contract is at a maximum bullish 100. And the small retail trader is still heavily short. You are one of those traders. You latch onto anything that agrees with your bias even if it is an incomplete data point like the one you’ve found somewhere about the commercial position. Who ever published that data didn’t know what they were doing. The best timing comes from the NDX contracts and those still have a long way to go before signalling an intermediate top. Again let me stress that anyone who is serious about trading absolutely must have a subscription to sentimentrader.com. It will save you from making all kinds of stupid mistakes. 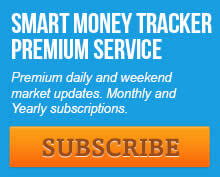 Except subscribers of the smart money tracker.. Both oil and gold already below Yelens speech announcement. Biotech continues to wallow at the lows. Next leg down for Biotech is going to be a dozzy. E-mini to hard for me this week….. Anyhow, just an opinion on what I’m doing……. Only Long Oil/Energy SU and old COS and may buy a Russia based Energy ETF as they got kicked in the head….. I kind of think your are probably correct. The more logical top (for the daily cycle only) would be on a gap up on the jobs number. I’ve been lurking for a while.. this might sound silly, but may I ask what the premium subscriber and the aggressive offers? The aggressive portfolio is for high net worth individuals that are very experienced traders only. Here is a video sample of what a weekend report covers. What is considered high net worth? Relative range? 100K+? 1M+? At least 1 million and lots of experience with options and knowledge of how to control risk. I guess I missed it. I check in in the mornings around 8:00 eastern time. I didn’t see the offer then. I might have taken you up on it.